Thank you for your interest in becoming a Habitat homeowner in Louisburg, NC! We believe that everyone should have a safe, affordable place to call home. By working with us from beginning to end, you will prepare for the various responsibilities of homeownership, including learning about personal finances, mortgages, maintenance and upkeep of homes and much more. Habitat’s path to homeownership is an important and in-depth process, requiring hard work, time and dedication. But this helps ensure the long-term success of Habitat homeowners. You can do it! Habitat homeowners must be active participants in building a better home and future for themselves and their families. Every Habitat home is an investment. For us, it is one answer to the critical need for affordable housing in our area, and we believe that stronger homes will create stronger communities. Prospective Habitat homeowners must demonstrate a need for safe, affordable housing, be a US citizen or permanent resident, and have lived or worked in Franklin County for the past year. Be able to pay an affordable monthly mortgage payments. Mortgage payments are cycled back into the community to help build additional Habitat houses. Every year, income ranges are determined to help us select applicants. 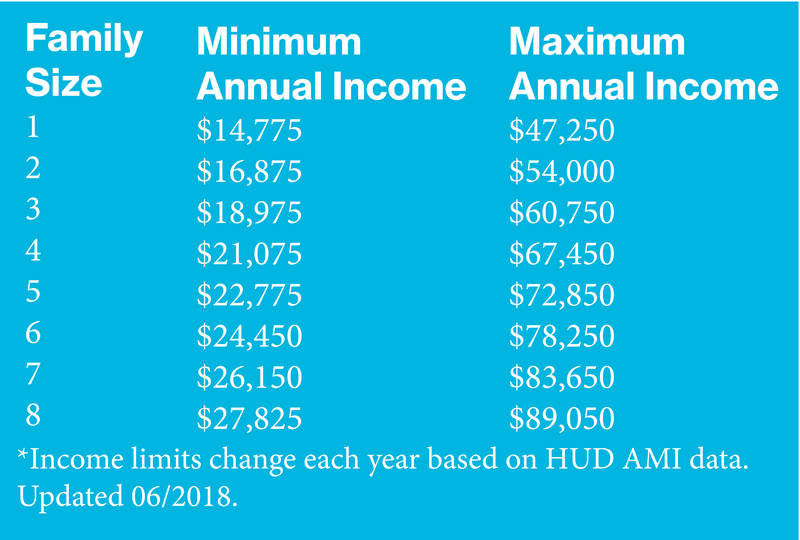 See the chart for this year’s income guidelines. Be willing to partner with us throughout the process. This partnership includes performing “sweat equity,” or helping to build their own home or the homes of others in our program. Sweat equity can also include taking homeownership classes or performing volunteer work in a Habitat ReStore. What is sweat equity? Sweat equity is the non-monetary investment someone makes in the building process. It’s about doing the work — the hard work — to bring an idea to life. At Habitat for Humanity, sweat equity is a new homeowner investing in their home or in another family's home. It’s not a form of payment, but an opportunity to work alongside volunteers to bring a family’s dream of owning a home to life. Sweat equity can take many forms for partner families working with Habitat. It can mean construction work on their home or on another family's home, cleaning up the build site, working in a Habitat ReStore, assisting in administrative duties, or countless other ways of helping out. That co-worker approach informs Habitat’s emphasis on sweat equity: all of us work together so that homeowners can achieve the strength, stability and independence they need to build a better life for themselves and for their families. The online application will take you about 30 minutes to complete and there are several pieces of documentation that you’ll want to have handy for each person you’ll be listing on the application before you start the process. Please apply by completing the pre-application below with accurate and up-to-date information. Applicants who complete and meet the required qualifications of the pre-application will be invited to attend a homeowner information session. If you have any questions, please contact Beth Foley, Sr. Director of Homeownership and Neighborhood Programs.